I freely admit that I am stretching the definition of horror by including The Last Circus in this year’s Oktoberfest. But if you’re a fan of filmmaker Alex de la Iglesia, you know he stretches the definition of any genre he turns his attention to, whether it’s westerns, romantic comedies or action thrillers. 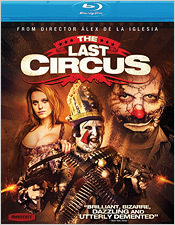 The Last Circus may not be a full-fledged horror film but any movie that features demented, machine-gun-toting clowns earns a spot in the ’Fest as far as I’m concerned. The story begins in 1937 in the midst of the Spanish Civil War. A military troop interrupts a circus in mid-performance and presses the performers into service. After Franco’s rebels defeat them, a clown (Santiago Segura) is made a prisoner of war with no hope of release. Years later, his young son Javier reveals his intent to follow in his father’s footsteps and become a clown. But thanks to his traumatic childhood, his father tells him he’ll never be anything other than a sad clown. In 1973, Javier (now played by Carlos Areces) lands a job as a sad clown alongside Sergio (Antonio de la Torre), an extremely popular funny clown. But when the makeup comes off, Sergio is also an abusive, egomaniacal tyrant. Javier falls in love with Sergio’s girlfriend, a beautiful trapeze artist named Natalia (Carolina Bang). He vows to save her from Sergio’s abuse… and that’s when things get really weird. Alex de la Iglesia’s movies are virtually impossible to describe. You just have to experience them and decide for yourself if you’re on his wavelength. The Last Circus feels like one of his most personal projects. Imagine Guillermo del Toro in Pan’s Labyrinth mode crossed with Jodorowsky’s Santa Sangre with a mix of Terry Gilliam at his most insanely inventive. Even if it isn’t strictly a horror movie, Iglesia uses horror imagery throughout to stunning effect. This is a dark, sometimes disturbing, frequently hilarious film unlike anything you’ve seen before. On Blu-ray, The Last Circus looks absolutely breathtaking. Iglesia shot the film digitally and the image here is razor-sharp, amazingly detailed, and wildly colorful. The 5.1 DTS-HD Master Audio soundtrack is fantastic, making full use of the entire range of audio. The disc also includes an English-language dub for those allergic to subtitles. The extras aren’t particularly in-depth but they’re not bad. There’s a brief making-of featurette, a handful of fly-on-the-wall behind-the-scenes segments, a 10-minute look at the visual effects, and three different trailers. I wish Magnolia had included an audio commentary. Since so much of the film is rooted in Spanish culture, Iglesia’s insights may have allowed for a deeper appreciation of the movie. When Alex de la Iglesia is allowed to unleash the full potential of his wild imagination, he’s one of the most unique and dynamic filmmakers working today. The Last Circus gives him plenty of room to play. It’s funny, scary, beautiful, sad, and visually stunning. Even if you don’t think clowns are scary, The Last Circus will prove that if nothing else, they’re pretty messed up.